Visitors to the Gibson House Museum often first notice the wallpaper in the grand entryway. It has become the most iconic symbol of the Victorian Era home, which is why I used it as the background for this blog. In this post, I decided to explore the origins of the wallpaper, and the international political context in which it was imported to the United States. Japan closed itself off from Western trade in 1639. It wasn’t opened up again for another two centuries. The re-opening of Japan began in 1853, when American Commodore Matthew Perry entered Tokyo Harbor with an intimidating naval force. This action led to political negotiations between Japan and the United States. In the next few years, the Japanese government decided to open up trade willingly, in anticipation of being forced to do so anyway. This led to the Harris Treaty of 1858, the first commercial treaty between America and Japan. In 1868, a revolution in Japan put political power back in the hands of the emperor. Under this leadership, it became Japanese policy to assimilate to Western technology, so as to avoid being usurped by it. One result of this policy was the establishment of a factory for kinkarankaragami. Westerners first saw large quantities of Japanese goods in the London International Exhibition of 1862, which prompted a craze for them. Among the items displayed in the exhibition were wallpapers called kinkarankaragami (which translates to “golden foreign-origin leather paper”). We call this Japanese leather wallpaper, because the paper is meant to resemble leather. This effect is achieved by placing moist paper on carved wood, then beating it with a brush until the design is embossed. After the paper dries, it is then painted, gilded, and treated to render it waterproof. The paper soon became popular, and easily accessible, in the West. Rottmann, Strome, and Co. was a London-based company that established themselves as primary dealers of the paper through a hefty contract in 1884. They had a showroom in New York, but the paper could also be bought through other suppliers in Boston, and presumably elsewhere in the States. The paper could be bought in pieces 12 yards long by 1 yard wide. 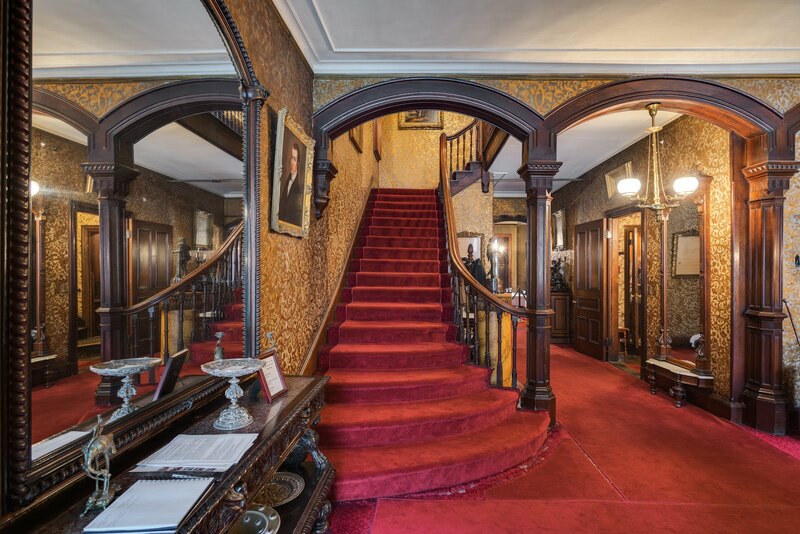 The 1890 Japanese leather wallpaper is still in the main entryway of the Gibson House today, although slightly worse for wear. The Gibson Society recently received a grant from the Amelia Peabody Charitable Trust to restore the wallpaper. The process will take place in early February, during which time the museum will be closed.. Check back for future posts with updates on the process and progress of the restoration! On November 1, 1856, the steamer Lyonnais left New York harbor en route to France with 150 persons on board. One of the 39 cabin passengers was John Gardiner Gibson, Jr., the oldest son of Catherine Hammond Gibson and brother of Charles Hammond Gibson (the first residents of what is now the Gibson House Museum). He was twenty-one years old. The next night, the ship Adriatic hit the Lyonnais, despite the Lyonnais’s having displayed its lights and sounded its whistle upon first seeing the Adriatic. The Adriatic kept going, not knowing it had done severe damage to the other vessel. The Lyonnais began rapidly taking on water through a hole in its side. The water put out the fires that would have kept the ship moving. Crew members and a few passengers tried to pump the water out, but cinders clogged the pumps so they resorted to using buckets. Excess cargo was thrown overboard to lighten the ship’s load, and mattresses were used to try to plug the hole. None of this was sufficient; water kept coming in. The crew guessed there was probably another hole on the bottom of the ship. The attempts to bail out the Lyonnais lasted for about seven hours. Meanwhile, a raft was built—out of such materials as masts, chicken coops, and doors—in case the ship had to be abandoned, because there weren’t enough lifeboats for all 150 people on board. By morning, it was decided to abandon the ship. More than 100 people piled into the five lifeboats, and 40 boarded the raft. Only one boat was ever heard from again. It had been boarded by 18 people, and only 16 were still alive by the time it was rescued, six days later. During that time, they had faced freezing temperatures, a shortage of water, and snow and ice storms. 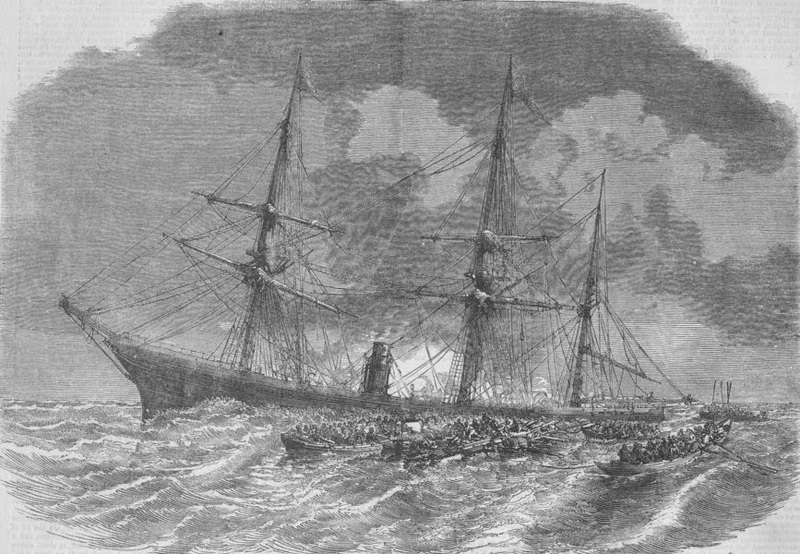 Overall, more than 130 people died as the result of the shipwreck. John Gardiner Gibson, Jr. was not on the recovered lifeboat. His body was never found. Chances are he was on the makeshift raft, which most of the cabin passengers had boarded. One of the crew on the recovered lifeboat speculated that the raft could not have withstood the rough sea conditions and probably disintegrated within a day of setting off from the Lyonnais. The story of the Lyonnais is tragic for many reasons. One is that Catherine lost a son, and Charles a brother. This loss must have been especially horrible for them given that John Gibson, Sr.—Catherine’s husband and Charles’s father—had died at sea eighteen years earlier (although of illness, not in a shipwreck). According to Catherine’s niece, she, “never ceased to mourn inordinately” over John, Jr. Countless others, of course, also lost a loved one in the wreck of the Lyonnais. An especially tragic aspect of this story was the failure to correct an obvious safety problem. There were not enough lifeboats on the Lyonnais. Forty people, almost a third of the people on board, had to rely on a makeshift raft. Does this remind you of any other shipwrecks of note? The RMS Titanic sunk in 1912—sixty-six years after the Lyonnais. A clear safety problem had been identified, but not fixed, for over six decades. John Gardiner Gibson, Jr. and 129 other passengers lost their lives, and no lesson had been learned from it. It took the deaths of 1,500 people on board the Titanic for this problem to finally be addressed. To me, that is the most tragic aspect of this story. Hawkes, Andrea Constantine. The Life and Times of Catherine Hammond Gibson: The Early Years 1804–1859. 2004.